John was born on 28 June 1842 at Madeley, Shropshire to parents John Shephard and Frances Ball. His brother, Joseph, was also a PM Minister. John was apprenticed to the drapery business at Hill Top, Staffordshire. He also spent some time working as a coal miner. John was converted aged 17 and with two years entered the ministry. John superintended the erection of 19 large places of worship, two class rooms, two minister’s houses and secured land for five other Connexional places. His obituary records that John was possessed of great determination and gentleness, he was a man of most courteous manners. He was a preacher and lecturer of great power, he combined thought, imagination and eloquence with a magnetic personality. Vast congregations were held and swayed under his ministry. At one church he conducted Anniversary Service for over fifty consecutive years. 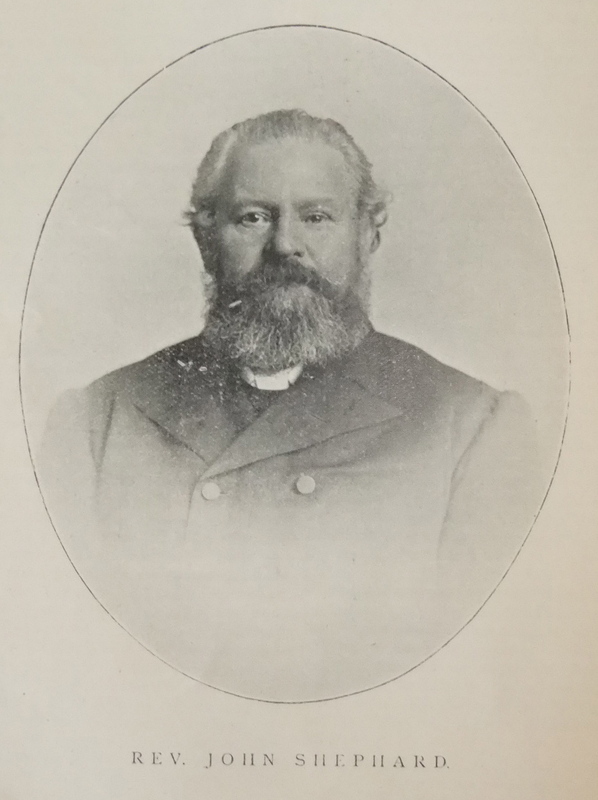 In the Sheffield District, John was for many years District Furnishing Committee Secretary and Treasurer of the district African Missionary Fund, also representing the District on the General Missionary Committee and Church Extension Fund Committee. John married Sarah Ann Jones(abt1839-1897) in the summer of 1866 at Shrewsbury, Shropshire. Census returns identify six children. John married Emmie Keziah Haywood (1871-1961) in the summer of 1898 at Chesterfield, Derbyshire. Census returns identify two children. John died on 4 September 1914 at Chesterfield, Derbyshire.